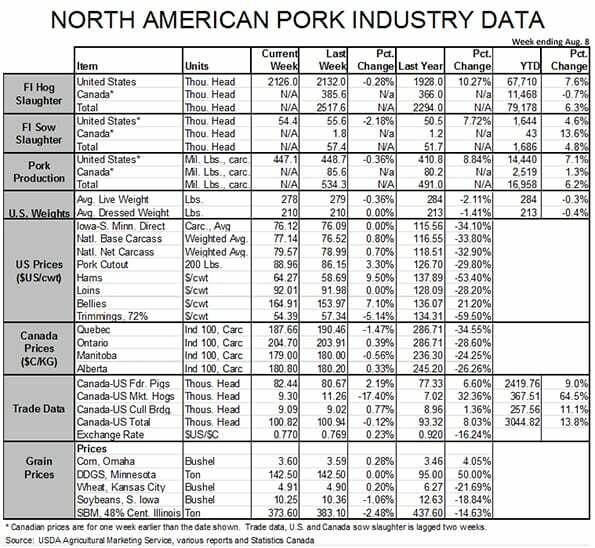 US - Given their price travails of earlier this year, pork bellies have turned into a value hero this summer, writes Steve Meyer in the National Hog Farmer. 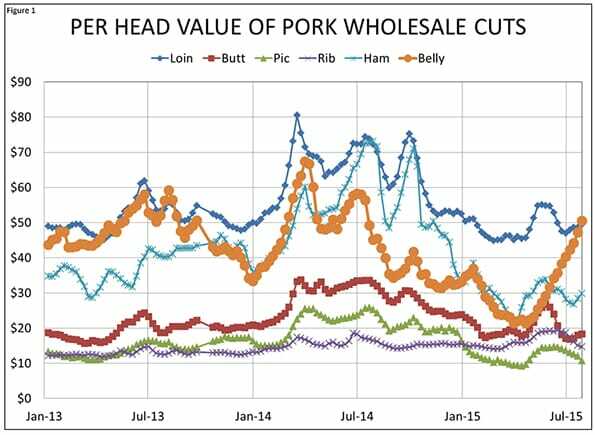 Bellies have been the bright spot among wholesale pork cuts this summer as prices have doubled since mid-May, and gained $10 per hundredweight just last week. We know that fresh belly production has been higher than last year by about the same amount as pork output has increased (+11.7 per cent the past four weeks and +8 per cent year-to-date) so this surge of belly prices is being driven by an apparent resurgence of demand as well as the culmination of two years of wild gyrations in frozen belly inventories. Those inventories got unusually tight back in 2013 and those low stocks pushed belly prices to then-record levels. Belly users vowed to never let that happen again and carried very large belly stocks in to 2014. In fact, monthly belly inventories were the highest of the last five years in every month from January through October of that year, blunting to a great degree the impact of porcine epidemic diarrhea virus on belly prices last year. Even though they did set new records in early April, the run-up for bellies prices was much less dramatic than were those of other cuts, especially hams. That experience seemed to convince the holders of belly inventories to vow to never again have that many in hand, and stocks have been maintained at a more normal — though higher than in 2013 — level this year. June 30 frozen belly stocks were 44.47 million pounds, 47 per cent lower than one year earlier but only 14 per cent lower than the five-year average. My judgment is that belly stocks are indeed lower, thus exerting some positive influence on prices but are not ridiculously lower than normal. It looks to me that the big factor in this summer’s belly price strength is simply the return of bellies and bacon to lower, more normal price levels and the impact that has had on consumer purchases. Those high belly prices in 2013 and 2014 had to be passed along to end-users. Since demand curves represent a negative relationship between price and quantity, those prices blunted the quantity demanded and the reduction contributed to last year’s higher inventories. When retailers and restaurants backed off of high-priced bacon, what happened? Raw materials prices fell. In fact, the USDA’s belly primal composite hit $63.85 in early April — less than one-third its value one year ago. The good news is that demand relationships are negative, and bacon is now again an attractively priced feature item. The even better news is that it still tastes better than about anything one can put on a plate. Increased featuring and lower stocks have processors chasing bellies once again – to the benefit of packers and producers. 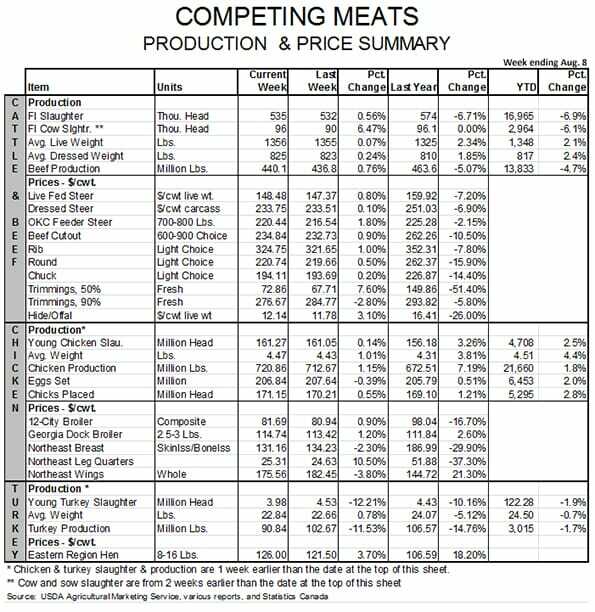 As can be seen in Figure 1, the impact has been huge with the belly composite primal value contributing roughly $15 per head more last week than at the end of April. 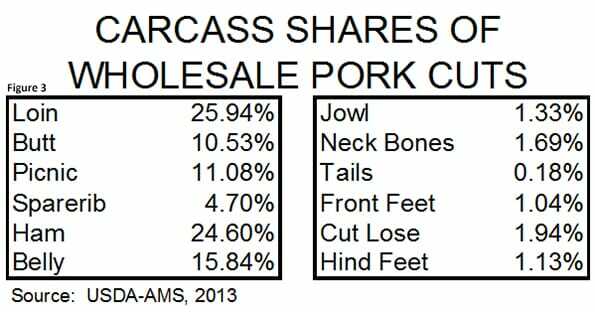 As of last week, the belly primal was accounting for 28 per cent of the total cutout value on just 15.84 per cent of the total carcass (Figures 2 and 3). That is the highest share of any cut for the first time since August 2013. A couple of other trends are noteworthy. First, the share contribution of butts, though down in recent months due to export challenges, has been buoyed in recent years by the emergence of pulled pork as a popular food trend. 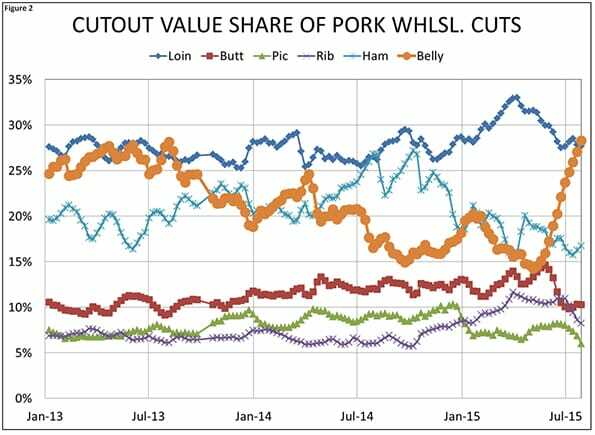 Second, the cut that has really suffered this year has been hams whose share of the cutout has fallen by more than one-third since last fall. They are worth only about $30 per head now where they were contributing almost $70 per head last summer and fall. Last week’s increase in ham prices was good news but the nearly 10 per cent gain in the primal composite still leave them over 50 per cent lower than one year ago.